On Tuesday evening, the Defense Department identified the three Marines as Cpl. Robert A. Hendriks, 25, of Locust Valley, New York; Sgt. Benjamin S. Hines, 31, of York, Pennsylvania; and Staff Sgt. Christopher K.A. Slutman, 43, of Newark, Delaware. They were all from the 25th Marine Regiment, 4th Marine Division, Marine Forces Reserve. Three other Americans service members and an Afghan contractor were also wounded in the attack, which occurred near Bagram Air Base. The wounded were evacuated and receiving medical care. Early reports on Monday from U.S. Forces Afghanistan incorrectly identified the contractor as an American who had also been killed, but an updated statement on Tuesday corrected that the contractor was actually an Afghan civilian who was alive and "treated along with other injured civilians." 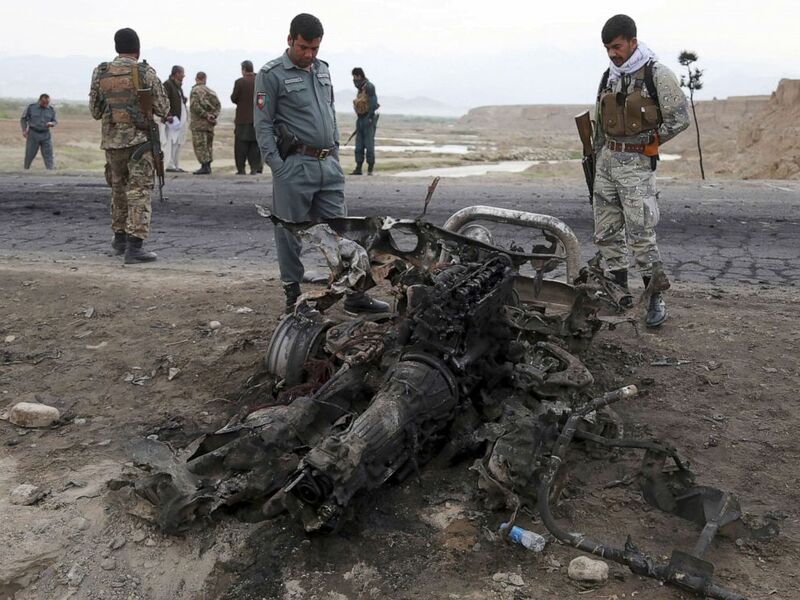 Afghan security forces gather at the site of Monday's suicide attack that killed three american service members near the Bagram Air Base, north of Kabul, Afghanistan, April 9, 2019. In a congressional hearing on Tuesday, Navy Secretary Richard Spencer confirmed that the three dead American service members were Marines. The Kentland Volunteer Fire Department identified one of those Marines Monday as Staff Sgt. Christopher Slutman, who served in their department as well as the New York City Fire Department for 19 years. "Through this trying time, we will remember Chris for the father, husband, brother, son, and friend that he was, the moral character he displayed daily, and the courage and conviction to serve his fellow Americans, both at home and abroad," the department wrote in a Facebook post. "We ask for your thoughts and prayers for his firehouse brothers, his fellow Marines, his friends – but most of all, his family," the post read.